The very idea of a hero fills the heart and makes light and heat in the mind. I recently witnessed a ceremony where awards for extraordinary heroism were awarded, and the presenter read from the award’s charter where they attempted to define the rare quality which they intended to honor. Heroes, in their view, were perfectly normal people who were compelled to do extraordinary things in tremendously hazardous circumstances, with no concern for their own personal safety. We might differ on details, but that seems as good an understanding of heroes as we are likely to get. As a kid, I had heroes – Chuck Yeager, John Glenn, Buzz and Neal, the version of Joe Leonard that smoked the STP Turbine Car around Indianapolis. They were men that went further and faster and to places where no man had gone before – all sporting Kodachrome smiles that belied the danger of the metal machines they all piloted, and that seemed utterly unaware of the not remote possibilities of their own deaths. Anyone that lives the life of the motorcyclist understands instinctively that there is always danger. The left brain part of me analyzes it, prepares for it, and does my level best, through focus, awareness, preparation and good decision making, to stay as far the hell away from it as possible. Consider my application for Motorcycle Hero summarily rejected. I’m OK with that. Calvin Rayborn, though, was entirely another matter. In an era when American Racing was centered on the dirt track, Cal’s lifetime of hustling a bike on pavement helped make him one of the most talented roadracers of all time. 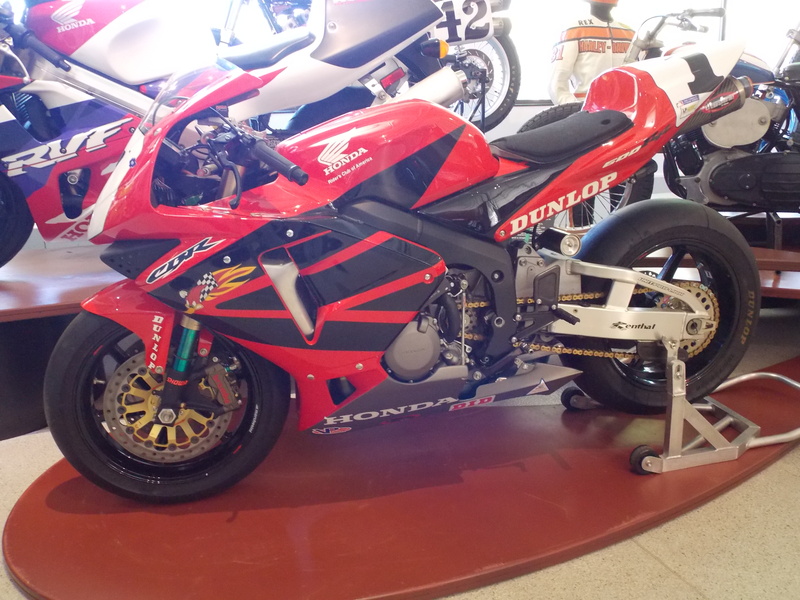 Don Vesco – another great who for a while tuned Cal’s bikes – recalled the young Cal, then known as ‘Slugger’, showing up for AFM Roadracing Events with his streetbike and basically wiping up the longtimers – even the ones with specialized racing machinery. 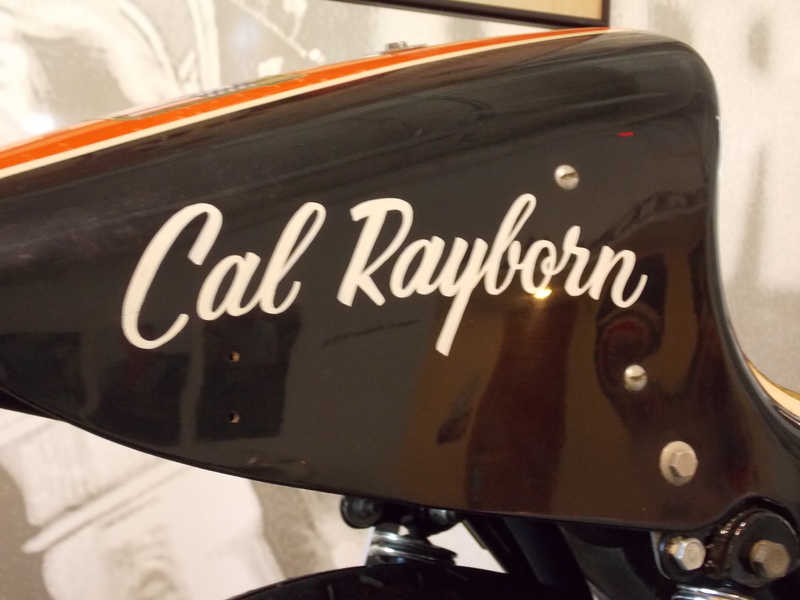 The Old Wise Ones at your local racetrack will always tell you that “It’s not the Bike, it’s the Rider, Son”, and there was no better illustration of that Wisdom than Cal Rayborn. 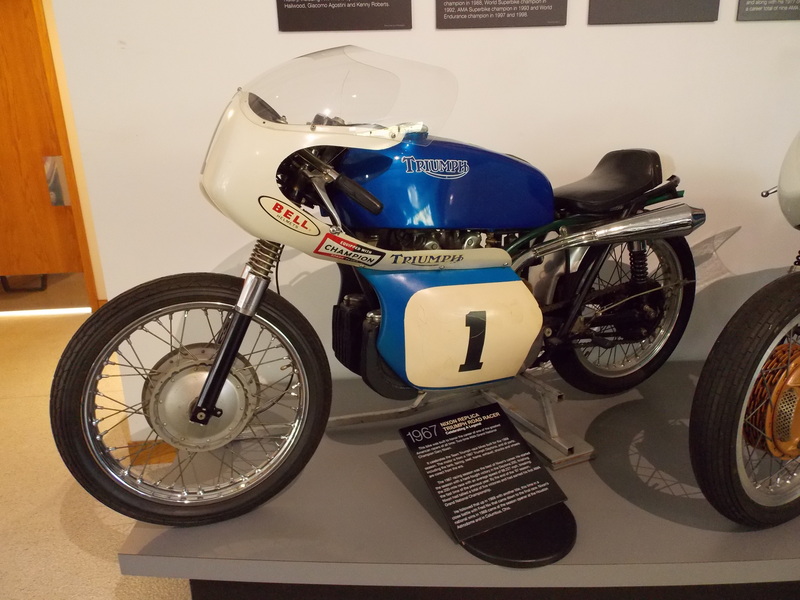 Rayburn’s record of 11 AMA National Race Victories and 3 Rounds of the 1972 TransAtlantic Match Racing Series was compiled on machinery that was by no means the best or fastest racing motorcycles available at the time. 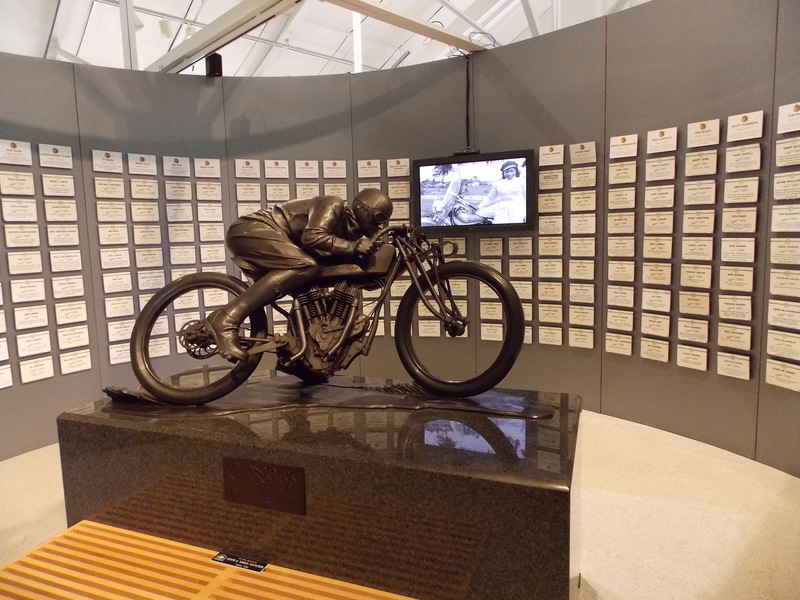 In fact, Rayburn’s entire career, both before and after he joined the Harley Davidson factory team, was characterized by winning consistently on motorcycles that conventional wisdom had identified as uncompetitive. I’ve already had my fun at the expense of Harley Davidson’s KR racebike – a 1950s tech chassis powered by a 1930’s tech, iron barreled, side valve flathead motor. 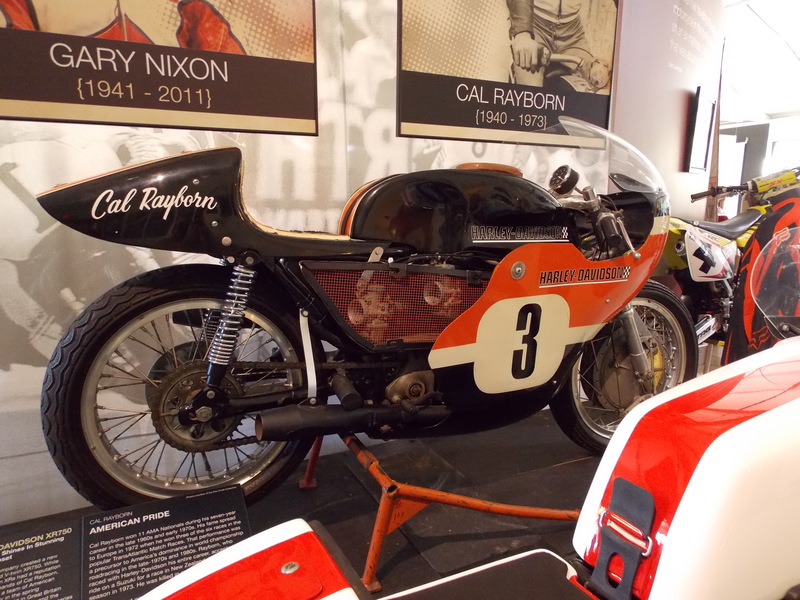 The KR was lawnmower tech gone racin’, and Cal won not one but two Daytona 200s on roadracing KRs – outriding and outlasting an ever increasing number of two stroke powered racers. When you are a young motorcyclist, lots of folks will provide you with utterly wrong advice. A lot of that wrong advice is perfectly well intentioned, but simultaneously perfectly wrong. One of those gems of flawed wisdom is that if you break traction with the front wheel, you will certainly crash. 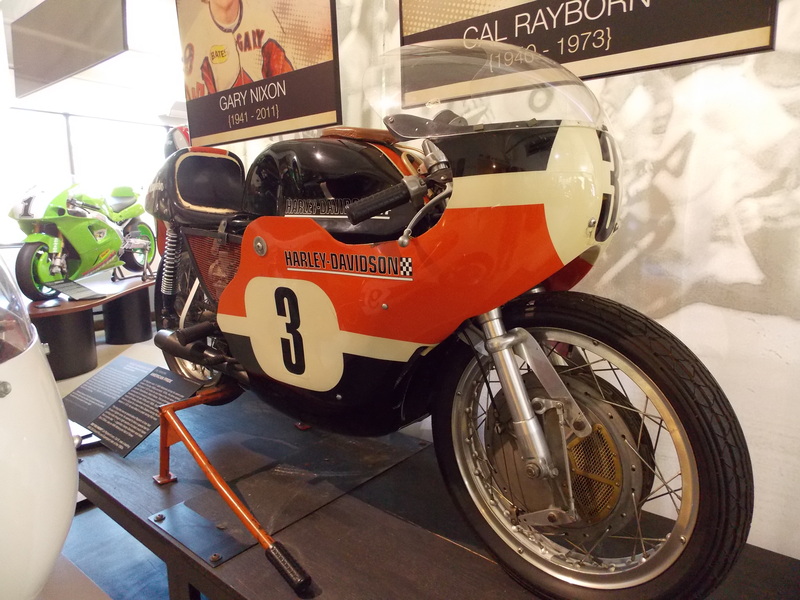 Rayborn was notable for being faster in the corners, and the tighter they were the bigger his margins – Vesco describes a style where Cal would carry far more speed on the corner entries than other riders, and then would drift the front wheel to scrub down to his apex speed. This is pretty common in current MotoGP racing, but in 1967 Cal might have well been from outer space. In the 1968 Daytona 200, Cal lost the front end of his KR doing that, and slid so far on the side of the bike that he wore through the knees of his leathers (way pre-pucks) and put a small hole in the KR’s belly pan before muscling the bike back onto its tires and winning the race. Cal was faster and more consistent on slower motorcycles than riders equipped with the latest low mass 2 stroke missiles – a rider that made a mental leap past his own fear and into an unknown realm where Cal was getting everything out of it his bike could give, and everybody else was back there somewhere. And winning with the Flathead KR wasn’t a fluke. When our British Racing Brethren organized a Series called the Trans-Atlantic Match Racing Series, they invited Cal and he knew he wanted to compete. The HD Factory Team refused to either contest the series, or to sponsor Cal. Cal eventually found and borrowed an Alloy Barreled XR roadrace bike, and in a country where he’d never been, and on tracks on which he’d never raced, and with a technologically disadvantaged, slower motorcycle he won 3 of the 6 rounds, and came home with a lot of new and dedicated British fans, who knew they’d seen a racing hero. 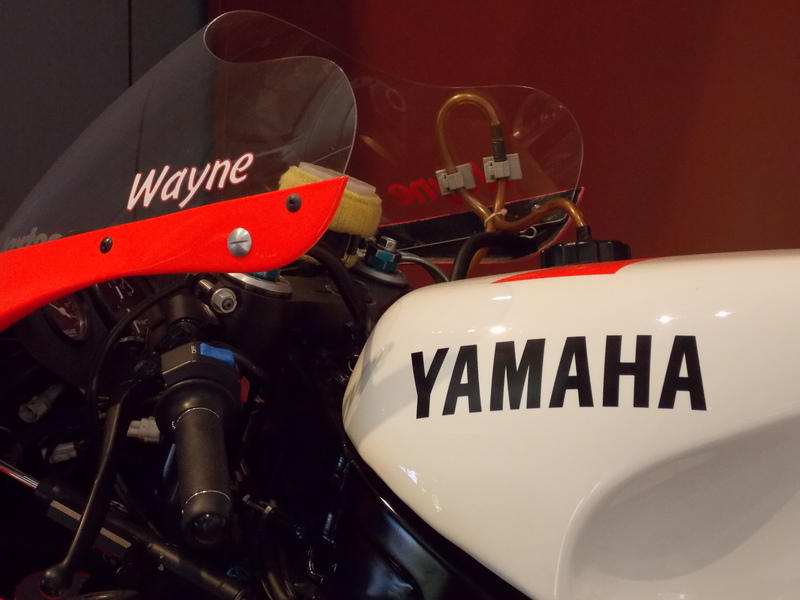 I came to my motorcycle enthusiasm later in life – later than 8 year old Calvin anyway – but when I started to really pay attention to Grand Prix racing there was only Wayne Rainey. Don’t misunderstand me, it’s not like there weren’t other talented racers on the track competing against him. There was enough talent to fill several GP grids – Freddie Spencer, Mick Doohan, Eddie Lawson, Wayne Gardiner, Kevin Schwantz. All of these men were talented, even gifted riders, but for those three years — 1990 – 91 – 92 – Wayne Rainey looked and raced like a superhuman hero. With his California Dude good looks, Hollywood smile, and Marlboro Yamaha matching leathers and motorcycle, Rainey just looked he floated a full foot above the ground, and like all he needed to achieve full SuperHero status was his own cape and a comic book. His behavior on the track was right in line. Wayne didn’t arrive at the top shelf with no steps in between. 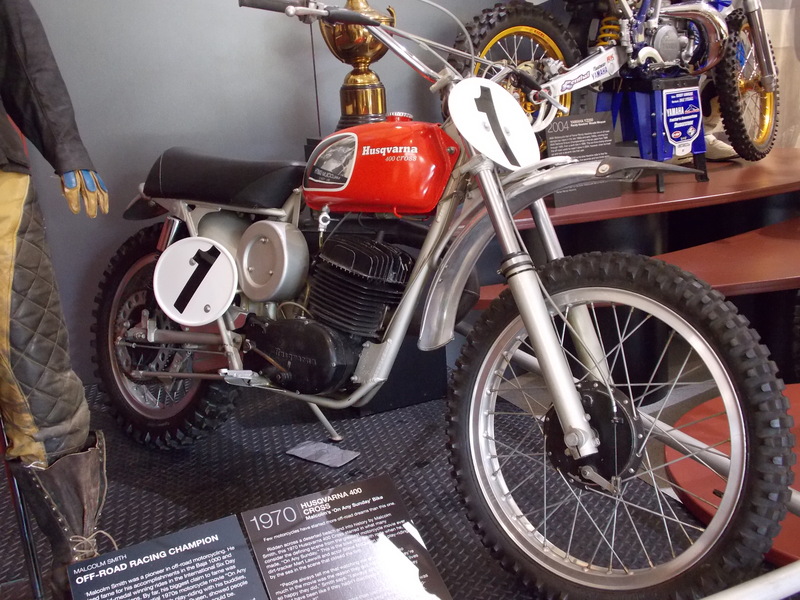 Like many future champions, Wayne started early – riding at 6 and racing by 9. 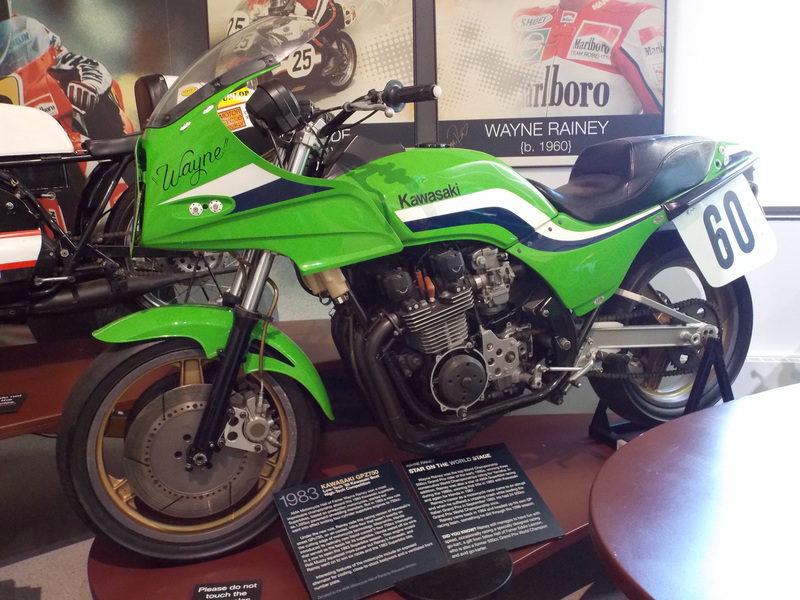 Figuring out early that his talent lay on pavement, Wayne ended up with a Superbike ride for Kawasaki, and competed successfully against racers like Mike Baldwin, and his Kawasaki teammate, Eddie Lawson. By his second Superbike season, Wayne brought home the Number One plate, and was rewarded for his troubles by having Kawasaki withdraw from racing – leaving him unemployed — as the American economy melted down. Rainey bounced around in 250 GP and AMA Formula 1, looking for a bike and a team that he could take to the hole. And he found that team when he was hired in 1988 by Marlboro Team Roberts to ride in 500 GP. 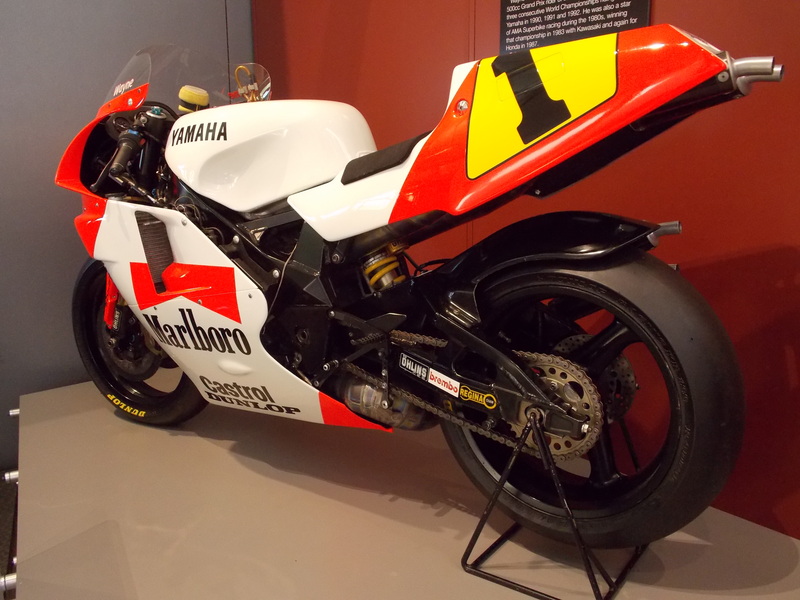 With Yamaha’s tire smoking YZR500 V4 2 stroke racer and Team Roberts, Wayne began winning consistently, and by 1990, Wayne started a run of consecutive Championships that was only stopped by catastrophe. Races like the 1993 Japanese Grand Prix help to understand what an extraordinary racer Wayne Rainey was. In a 21 lap race there must have been 60-70 lead changes, with Rainey, Schwantz and Shinichi Itoh playing 3D Chess with GP bikes, taking positions and having them taken back by their opponents corner after corner. Itoh’s Honda looked to be up on raw power, taking the lead on the Suzuka circuit’s long straights, but in the curves the race quickly became a full on knife fight. Rainey stayed always within striking distance of the leader, and with two laps remaining, and showing off the tire spinning style of Team Robert’s namesake, simply put his head down, made a critical move and just walked away from the rest of the field. Like all heroes, Wayne knew when it was time to ride toward the direction of danger. It’s a shame that masterful confidence and surety only seems to work for so long. In a place like this, there’s no shortage of heros. Like Nixon, Emde, Mig DuHamel, Malcolm Smith. After this much stimulation, the brain oil gets overwarm, it starts losing power up top, and the next thing you know you’re on the crash truck for the day. At least that’s how it went for me. After more heroes and quite a few heroines as well, I just couldn’t take it all in any more. Then you come round a corner, and it all gets quiet. Because there it is, the actual Hall of Fame. It comes off almost feeling like a church – a semi-circular wall focusing on a bronze of a pioneer Indian flat track racer. 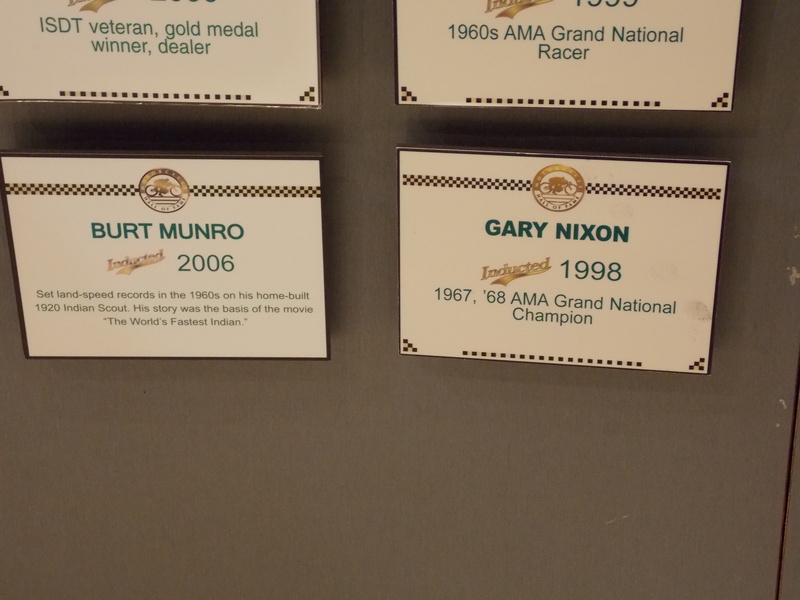 Around that wall are the small plaques commemorating the Hall’s Inductees. At the rear there is a video monitor that plays a collection of historical footage of the heroes behind the bars. It’s a place of contemplation. Of reverence. Telling this story I became acutely aware of how much more I was forced to leave out than I was able to tell. 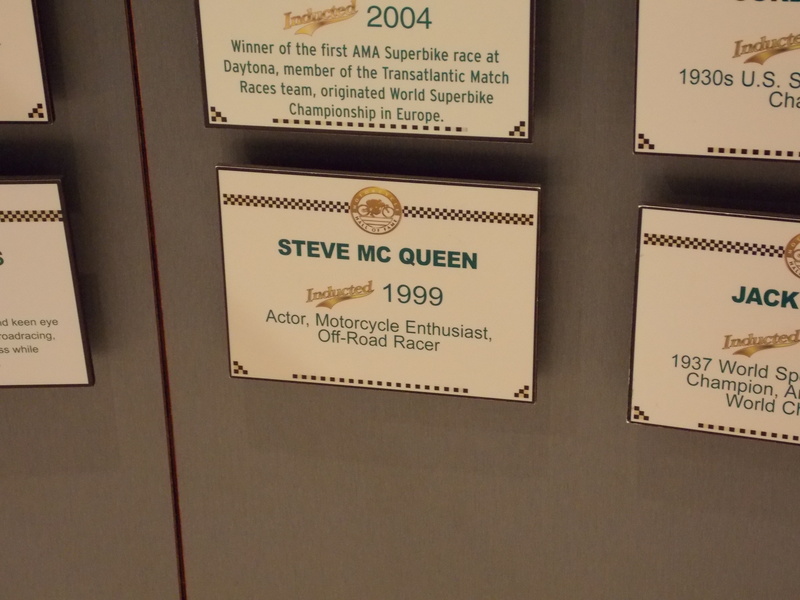 Of things like the memorial wall, where the names of a few of my friends – who’ve gone to riding better roads — can be found. Of stories like Dave Barr’s – who didn’t let the fact that he’d lost both is legs in combat in Viet Nam keep him from riding around the world on his Harley Davidson. 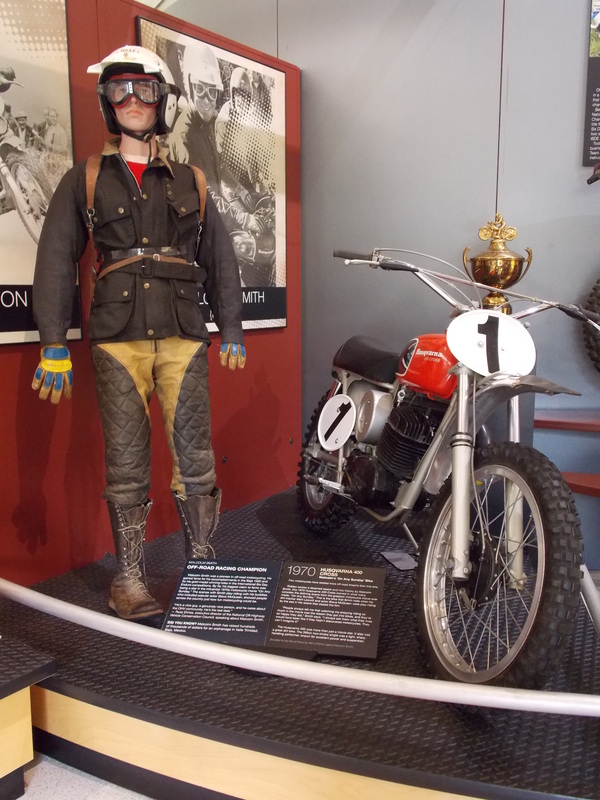 Or a million other objects – trophies, old photos, racing leathers, a flat track racer’s steel shoe. Which is why you owe it to yourself, if you love motorcycles, to go to Pickerington and experience it all for yourself. I’m always happy to tell you my stories, but sometimes you just need to make your own. There are lots more pictures of our trip to The Hall — the entire album can be seen here. 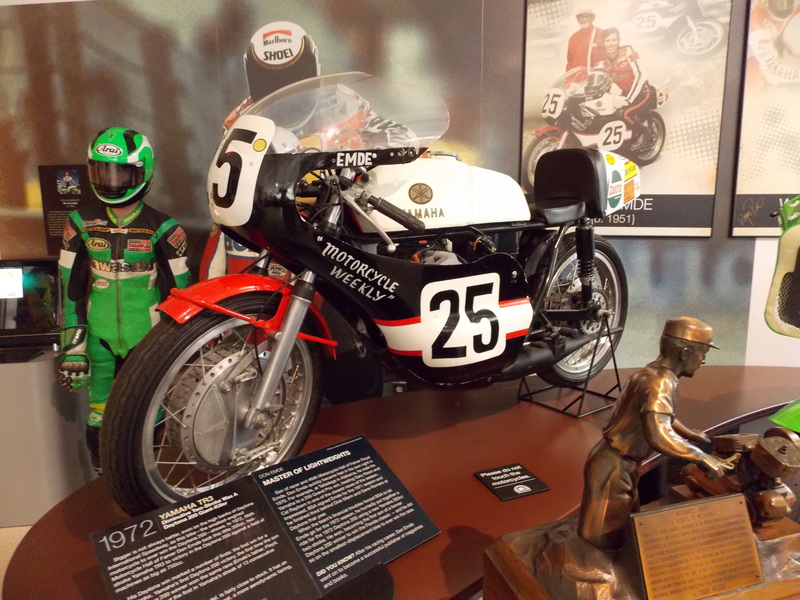 This entry was posted in Characters, MotoHistory, Racing and tagged AMA Hall of Fame, Cal Rayborn, Dave Barr, Don Emde, Gary Nixon, Malcolm Smith, Miguel Duhamel, Wayne Rainey. Bookmark the permalink.